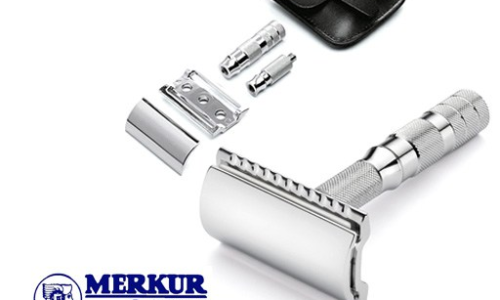 This following blog is about the safety razor companies which we sell products of. Like Giesen and Forsthoff who are a 1920s German company. Who survived through difficult times throughout the 20th century and still make excellent product’s. 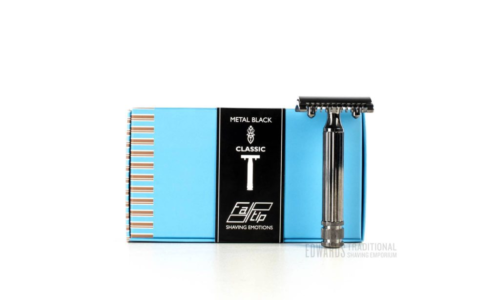 During the 80s an 90s they were known for light weight short razors like the TTO which sport the butterfly mechanism. Which is a very traditional style of razor that spins to open and insert the DE blade. These come in many colours and are relatively inexpensive. We have been outstanded in the companies new Vintage range which is bang on with a understatted cool. Using precious hard woods and plated chrome, they forge these excellent safety razors in Solingen the home of German shaving. They are rather large razors that are perfectly made which come in brilliantly presented boxes. This great company started in 1845 as a barber shop. Mr Jeremiah Taylor was himself a barber who also made and sold lotions from oil extracts from the shop. In guess where? Bond street London. Now in Jermyn street they have perhaps the most abundant stock out of any gent’s grooming company anywhere. 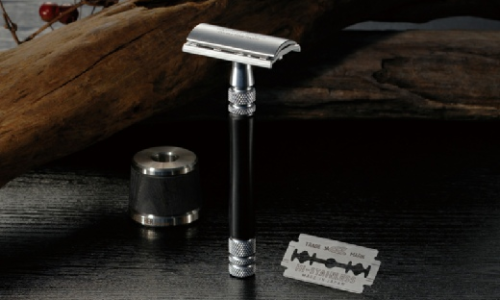 A strong safety razor they have made for sometime now is the 13500 which is nickle and a wonderfully ornate. The design has a great lattice work that is wonderfully cast. This slightly smaller razor has a wide head for really ploughing through that growth. 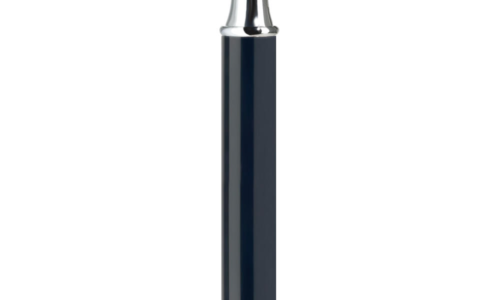 It is a really elegant razor and we obviously support English Industry. These razors are quite the oddity. A 195o’s stylish company that again sell zinc razors that are cast at the factory in Italy. The style of razor is very Art Deco which we love. But the very unusual thing about them is they produce non aggressive and aggressive razors. There is no middle ground but we think it’s great we are given the extreme options. The hard shaving range is called Classic and the non aggressive is Gentile. I am also a sucker for a gold razor for reasons of glamour and arrogance. We have a large amount of this German companies safety razors on the site. Known for there impeccable build quality, this family business started in 1945. In East Germany they made no profit under Soviet rule and survived and thrive today as one of the best shaving companies in the world. 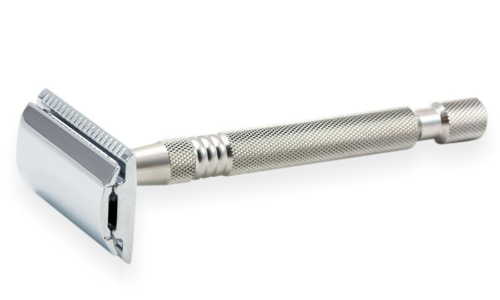 There best known razor is the R89 which is a real powerhouse it is chrome and perfectly machined. Muhle generaly make middle aggressive razors that are a great standard of shaving. They have a great choice and diverse range of style and pricing reflectively. Also they have a really top range which are limited edition that are made from precious wood and sterling silver. Safety razor and the not bothered. Some people are keen for the best shave possible. Which i can understand, however I have things to do. When I originally started safety razor shaving I was keen for the smoothest chin in the world. Pretty much everyone who has experienced a professional wet shave from a barber. Rubs their chin after as to check how the abrasion stands up to their personal shaving method. I would then rub my face throughout the day and the begining of the next day saying how uniformed even the growth back was. Until i needed to shave again. I stopped doing this with a safety razor ages ago as my goal every morning is to remove the stubble from my face. Not to compare it with that of an Essex girl as my hair will only grow back. Perhaps waxing monthly would suit some men, this would only work if they had the lightest of facial hair. Facial hair that could only be compared to that of an Essex girl. Otherwise the waxing would scar the face and still hair would grow back. My brother in law asked me for advice on behalf of a friend who shaves sometimes several times a day. Always he would shave at lunchtime as his hair has such a rapid growth. Understandably he found this a real chore everyday and considered waxing from a professional. Who then informed him due to the mass of stubble he has would have scars on his face. Also that his hair would grow back on his face making the painful task pointless. I suggested the fierce Muhle R41 as a tool for him to really slay a few layers of skin of his face. I also suggested that he should shave with two passes every day for reasons of exfoliation. When I have spare time, which is not often I test out different methods of safety razor shaving. To get that closest shave possible for my customers benefits as much as mine. I shave everyday with one pass but sometimes I may apply a J turn or hook. This is a great move for the bottom of the cheek where my stubble gets thickest. The method being pull the razor straight down the face and then twist it ending with a 90 degree angle. This seems to be a deeper shave and takes a few layers off anything in it’s path. You can also employ this with great care on your neck. Also reading the map of your stubble is a great idea as my neck hair goes the opposite way as my neck. Another brilliant although different condition for the shave is when you have a few days growth. Is the blade buff this is pretty close to the exact technique used by barbers. This is when you dont take the blade of your face but you drag the blade back and forth on the hair. It is amazing how little you become cut from this method and is a great way to relieve a weeks camping beard. 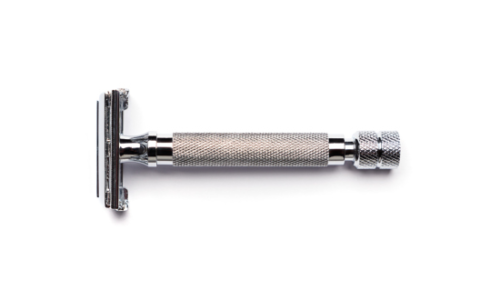 As strange as it may sound, but last night a safety razor saved my life. Not so much last night but more in my old life. I have as you can see created a rather appalling play on words based around the disco song by Indeep. However there is an element of truth in all of this. I used to not care about my personal appearance for a few reasons. One of which was my party lifestyle that led me to be weary for the week ahead, also the fact that I was poorly guided in my adolecense. Luckily my parents don’t read this, but they realize their failings due to me constantly reminding them. The other and main convoluted point is, despite shaving in the 20th century was made for efficiency. It sure enough became a lot less glamorous. A moulded lump of plastic and some sports bag branding, was all I had to look forward too in the mornings. That and extortionate prices of cartridge blades. I sadly went one step lower and used the multipack bags of disposable razors. That’s right things were dire. I also spent a large amount of time in my teens without a girlfriend. I realize how ironic this is due to my social standing and great cheek bones. But it’s true, sometimes I applied deoderant but generally I did not compete with other peers. Also i was in a vicious circle. Why shave? I asked myself, for I have not a girlfiend to take too the ball. Then something big happened to me, which was my finding of traditional shaving. It represented a better era of mens elegance and also items that were made to last. None disposable goods made by craftsmen and used by gentlemen. 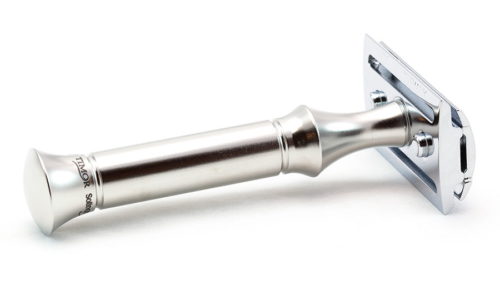 Which is what a safety razor is really. I see it is as a lead guitarist and singer in the band. the shaving brush on base and the soap of my choice on drums. We are driven by imagery, like the man saving for a mortgage imagines the modest house. The actor student imagines the oscars. When I shave now I immediately think of my high end shaving kit that provides me with an excellent shave. In the beginning there was nothing. Then we came along at the same time as other mammals. We were a pretty hairy bunch and some people still are, myself being one of them. In the olden days according to pictures drawn or carved. people had beards bar most women, prior to the invention of the safety razor. This is natures way of staying warm, also perhaps making some protection from teeth and claws. Since the opposable thumb, hair has not aided the fighting process really though. For it can be grabbed and yanked by an assailant or be caught in a 18th century wool mill. Most men shave there faces, some men shave there bodies too and I am one of those men. Women prefer hairless muscular bodies judged by my research. However for years women stated once i revealed my chest carpet, that they liked my dog like complexion. I take there reaction down to two things. Firstly politeness they don’t want to be rude about my physical state. Secondly I think that they were acceptant of my physical state. Imagine if it were the other way round and you realized that the girl you had been flirting with and beating off rivals for. Had inch thick hair all over her breast, it happens. Also some men say when noted as being primates something like. ” Well i am a mans man, with lots of testosterome.” Women don’t see hair as particularly manly, on conversing with some women they say less hair is best. Beards may be different, but as lot of girls that are keen for their guy to have the look. They might not want to have a kiss and cuddle with it. Also hair is porous that’s right it soaks up oil and dirt and all sorts of other stuff. If you have a body odor issue you should definitely consider shaving of your body hair. Also remember that hair gets greasy. It is my recommendation if you are a hairy guy and for certain reasons don’t want to shave there chest arms or legs. Use shampoo on your hair, women are repulsed by your greasy chest hair but nobody told you. I shave my legs and arms after looking at a photo of these blocks of darkness that contrasted my very being. Also hitting my 30s has made me maximise my pulling potential. I do squats and I wear shorts so I shave my legs. Not wet shave no but use clippers. There I said it I embrace the fact that I have the balls to look good on the beach. How safe is a safety razor? An interesting bold question recieved by Mike in Somerset. I considered this question from some different angles, which led to more questions. But now I believe to have a concise enough answer for my readers. Compared to what? is my first question to answer Mike’s question. How safe is a safety razor? A Mach 3 cartridge razor can sever ones chin and lead to embarressing marital photo’s. I am single too all those lady shavers out there don’t worry, it was an example. Right back to mikes question, which quite frankly Mike I find obtuse, I mean you are really suggesting that they are unsafe aren’t you? Mike firstly don’t just buy a safety razor, or restore a early gillete. Which can start you off on the wildest of horses that would be unsafe. I bought a razor for looks for my first. The only subject where this works is finding a lady friend. I bought the gnarliest of toothed safety razor and had a hard time with it. It almost made me loose faith in traditional shaving all together. Choose a middle aggressive razor like muhle or Giessen or a non aggressive razor like Feather. I shave most days with a Fatip. I have an exceptional technique in which I have refined over years of shaving and understanding the grain of my beard. Also I see my face in sections and subtract the lather in flanks. Although a neck and chin should be treated differently. I recommend pushing your head back and tilting your chin down making your chin bloat. This feels like a poor shaving surface, however it will make it boyant for a safe shave, it will also do the same for your throat. I find to eliminate cuts, if that is your fear. Thinner blades have a flexibility which gives that bit of insurance from cuts, like Lord or crown. That is my best answer mike also there are some gold dust tips in there for your knowing. If you don’t have a beard you shave. Wether it’s once a week or everyday. I am a every day or every two day shaver, therefore I value my safety razor as a life tool. A razor isn’t a one off tool that you need for a specific job. Like a magnet on a string which is only purpose is to retrieve metal objects which have fallen down drains. That has come into use once in your professional life. A razor is something that is a tool for constant manintenance. My mother used to buy me a bag of bics every 6 months or so and also a can of presurized foam. As this was the same method of shaving used too shave her beard off, when the circus wasn’t in town. I alway’s viewed shaving as a nuisance and once or twice even had the lack of dignity enough, to try and burn off my teenage fluff with a cigarette lighter. I cringe at this memory as I am obviously now shaving royalty. Now my shaving shelf is worth a few bob and for good reason. One of which is that I work in the high end shaving Industry. Another is that gent’s grooming as a lifestyle choice is key to a happy existence. When I summarize the golds and chromes, and the vintage and modern shaving kit I have. I feel pride. Also It is my duty to condition this kit like a vain SAS soldier. I hate slovenly care of quality goods, people that treat there nice stuff like trash clearly demonstrate that they have a lack of respect for everything Including themselves. If you call us or email us we will tailor make you a shaving kit. I assure, you will be delighted with the results. A good question and fairplay to myself for asking it. The more expensive Safety razor blades on the market are Feather, but does it mean they are the best? Certainly the two above are high quality in terms of material. This will lessen any oxidation build up inside a dormant razor which is a positive. Also these two razors are certainly firm, however a firm razor blade is less forgiving than a flimsier blade. Feather are the sharpest of DE blades I would confirm, Muhle are also very sharp. The combination is a great shave although I would not recommend either to beginners. I use Muhle and Feather and I am obviously pro Muhle as they are the most sold goods on the site. But the less expensive blades like Crown, Big Ben or 7 oclock create a safer shave. I think this is down to the added flexibilty in the blade, my theory follows. 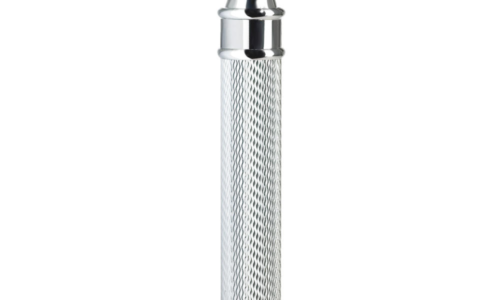 We always advise wet shavers using a safety razor to apply the razor onto loose skin. This creates a bit of slack that stops the blade getting purchase to cut skin. I shave like this everyday and fully back this technique. Today I used a 7 oclock blade for the first time shock horror. The Industry of a lot of blades like Crown or 7 oclock is based in the middle East. The English machinery has been bought and transported to such countries as Egypt and Dubai for your information. 7 oclock is a Gillette product and made in Russia. I am not sure if this St Petersberg company has bought the franchise. I would suggest not due to the psychopathic business model that is Gillette. My 7 oclock shave was spot on, it was such an efficient shave of one day growth. I also felt very safe with it’s flexiblity, so much I could shave quickly. The branding of 7 oclock is pants, I have avoided this blade souly because of how rubbish the box is. Advertising is everything there is such little brand depth to these blades it looks like they are a tiny pack of cornflakes. Turns out the shave is top draw. 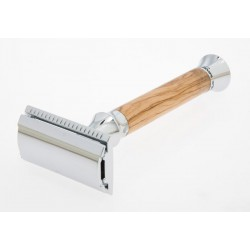 Which DE safety razor blades should I buy. By Edward. Today I awoke from my slumber realizing i needed to shave yet again. This time it seemed I had not shaven for 2 days. I filled the sink with hot water and splashed my face and neck. Sometimes I shower prior to the shave, so it heats up the grain and soaks it. This is probably the best method other than the hot towell treatment at your barbers. Let’s face it, you aren’t going to do that every morning. Fully heated and prepared I chuck my shaving brush and safety razor into the sink. I always leave my razors unscrewed. I have explained this in previous post’s, it will stop any rust build up or at least most. Lets face it nobody cleans there safety razor everyday, so leaving it unscrewed seems to help stop build up. Now I use a Muhle soap in my Edward’s bowl, I put the hot brush in it and whip up a lather. I then apply it too my gallant face in a whipping motion until it is thickly coated. My opening strokes with my safety razor of current choice being a Fatip Gentila are important ones. I can be quicker with my cheeks as opposed to my throat which is a knobbly old thing. So I employ a solid J turn, yes akin to the teenage joy ride maneuver. Basically you pull down the razor in a long stroke then curve it into a J movement. This actually slides the razor slightly down your face which seems like a risky move. However it seems you can get a fair bit of control on the stroke and can just trust the movement. I spend a fair time on my jaw line and actually shamfer it in line. I also re apply lather until I am content with the shave. I then arch around the back of the jaw below the ear which is often a place I can easily miss. My grain goes backwards down my throat, so I shave the opposite way to my face on the initial pass. My throat i always lather well and pic individual hairs of my Adams apple. I then jump in the shower like a boss. Everyday wet shaving has been an Important ritual for most of the male population since Edwardian times. Before that the Moustache was a popular choice and also for the military, compulsary. Barbering and wet shaving came around in the 18th century where you could inexpensively have a shave. Although seemingly time consuming, the higher class gent would certainly have this treatment more regularily than the lower. The barber as still do, would use a straight razor. The safety razor came about in around 1860, although at the time the name was probably somewhat ironic. Beards were before all the shaving, although shaving goes back to the ancient Greeks. It was time consuming and done will a lump of sharpened metal. Beards came back into fasion in the 1960’s to embrace the hippy culture. These seemed to have hung around until the late 1970’s. In and around 2010 we strarted seeing a rise in vintage fasion. I was scornful of this due to finding it thoroughly unimaginitive but looking at history this seems to be an occasional occurance. For example the renaissance which went on for around 800 years. Vintage shaving too became popular in around 2012, but not with the Hipsters of East London and Berlin. It became apparent through collating data that there was a great difference between fasion and lifestyle culture. Most buyers were people who were facinated by how beautiful traditional shaving is. To compare a Muhle R89 to a Gillete fusion is impossible. Handling this chrome razor you realize the craftmanship and machining that goes into this flawless piece. People love the process of assembling and cleaning a safety razor, it’s a far cry from the disposable non esteem razor. The girls which i occasionaly convince to spending time with me, definitely like the fact that I have a fancy shaving kit. I think because shaving is such an ordinary thing, they don’t expect to see a few high end pieces of metal in the bathroom. They thing wow this guy is pure class, he has nice stuff. They might even let you off having a pony car. The Edward’s home brand safety razor is shiny bit of kit, which will give you a boyant shave that will take off any length of stubble. At £25 it’s a steal, or you could buy a disposable and 3 packs of blades for £40? It’s your call wingnut. Even though I use nice safety razor and other shaving kit, doesn’t mean I don’t neglect it from time to time. If you leave a blade in a safety razor in a humid environment. Like a hot bathroom for a long period of time, that razor blade will rust. People try to get around this by using stainless razor blades. This will only stop the blade corroding through and essentially disintegrating. With an enclosed razor head it will create some oxidation leading to a rusty film inside the head. I certainly find this on my Fatip razor which is zinc. Chrome safety razors have less of this process it seems, but still you will get it. I put this down too the general disposable nature of razor blades therefore being a less quality metal than certainly the safety razors we sell at Edward’s. I get upset at myself when I let a razor fall into disrepair. Finding myself furiously rubbing off any rust inside the head. Trying to remove any marks. If you are at this stage though, I would recommend using newspaper and fairy liquid, as paper is slightly abrasive. Fairy liquid is lightly alkaline which should shift most stains. If you have a more intricately made razor, use a pipe cleaner and salt. It’s good to condition your razor as you will find grime and limescale in it, also you will find bits of yourself. Generally shaving happens in haste and if you were to clean a razor in the morning also you will certainly miss the 755. So take a bit of time on a Sunday to do this process. Generally for Safety razor maintenance. I leave my razor slightly opened, that’s right unscrewed. I rinse it loosened to clean it well and then leave it to dry like that. Only tightening it when I shave. This method seems to massively reduce any build up of grime and also stops this film of rust on the blade. Also not leaving a old blade in the razor is another way around any corrosion. Clean your kit guys, remember the reason why you purchased high end shaving gear. It is now your duty to maintain it and keep it in a good condition. Otherwise go back to the Bic’s me old fruit.